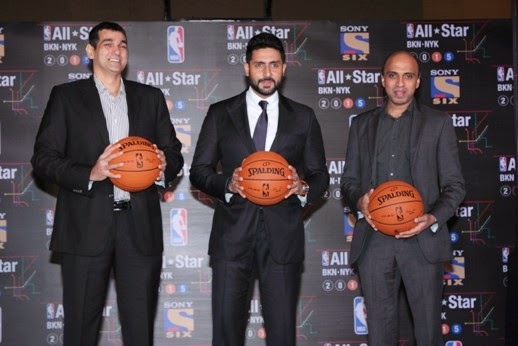 MUMBAI, Feb. 7, 2015 - Bollywood star Abhishek Bachchan will attend NBA All-Star 2015 and participate in the Sprint NBA All-Star Celebrity Game on Feb. 13 at Madison Square Garden as a goodwill ambassador to the league. Bachchan, a self-proclaimed Los Angeles Lakers fan­­­­, will meet NBA players and legends throughout the weekend and will go behind the scenes at NBA All-Star Saturday Night and the 64thNBA All-Star Game. He is poised to become the first-ever Indian to take part in the NBA All-Star Celebrity Game. Fans in India can follow Abhishek Bachchan’s All-Star experience on NBA India’s official social media channels, including Twitter (@NBAIndia), Facebook (NBA India), Instagram (nbaindia) and the Line App (NBA India Official Channel). Bachchan will also take over the @NBAIndia Twitter handle on Friday, 13th February at 9pm IST and answer questions from fans, who will have the opportunity to ask him about his favorite NBA players, teams and what he’s most looking forward to at NBA All-Star 2015. Bachchan previously helped support the launch of NBAstore.in powered by Jabong in May 2014. NBAStore.in powered by Jabong offers over 200 NBA products including shorts, jerseys and T-shirts for both men and women. Abhishek Bachchan is a Bollywood star and proud owner of Pro Kabaddi League Champion Jaipur Pink Panthers and Indian Super League franchise Chennaiyin Football Club. He has starred in many hit Bollywood films including the Dhoom Series and Happy New Year. Visit NBA.com/allstar for more information. NBA All-Star 2015 in New York City will bring together some of the most talented and passionate players in the league’s history for a global celebration of the game. The 64th NBA All-Star Game, which will take place Sunday, Feb. 15 at Madison Square Garden, will reach fans in 215 countries and territories in 47 languages. TNT will televise the All-Star Game for the 13th consecutive year, marking Turner Sports' 30th year of All-Star coverage, as well as the BBVA Compass Rising Stars Challenge onFriday, Feb. 13 and State Farm All-Star Saturday Night on Saturday, Feb. 14, which will both take place at Barclays Center in Brooklyn. Other events at Barclays Center include the NBA Development League All-Star Game presented by Kumho Tire and the NBA Development League Dream Factory presented by Boost Mobile on Sunday, Feb. 15, airing on NBA TV. Madison Square Garden will host the ESPN-televised Sprint NBA All-Star Celebrity Game, beginning Saturday, Feb. 14 at 5:30 a.m. IST.